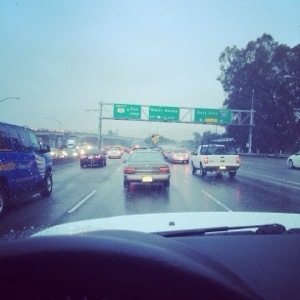 Greetings, blog-land. Today felt like a good day to ramble about some stuff I’ve been enjoying lately. Sort of a “favorites” round-up without the link-up because I’m lazy and sort of anti-social, even in the blogosphere. But I do want to share some cool stuff with you. This bowl. I just ordered a set of Calibowls on Amazon, and I’m loving it. True story, for the past 4 years or so we’ve been surviving with just 3 cereal bowls in our sparse little cupboard. First world problems, I know. But I had one too many moments of having to reach for a bowl with a hot or dripping something or other in my hands, and that was just unacceptable, especially if (when) I was in a less-than-rational mood. 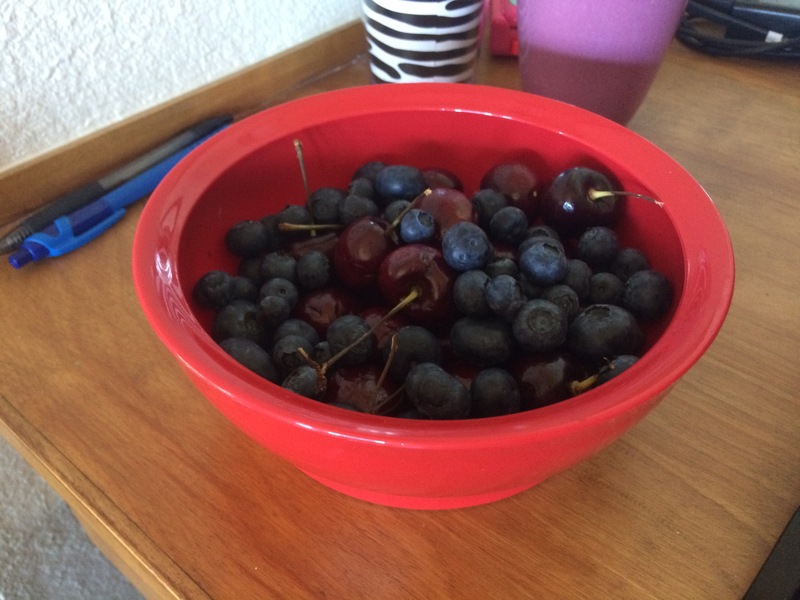 So now I can pile on the berries without spillage! Just missing some homemade whipped cream. Next up, The Skimm: (<- kind of an affiliate link, I get a pat on the back if you use it to sign up). If you know me, you know I don’t follow the news. I just hate how it’s all just sensationalist stories and biased journalism. I do want to know what’s going on in the world good and bad, but to skim through your typical Google News and it just freaks me out and depresses me. Enter The Skimm. Just a quick and light-hearted dose of all the big stuff going on, with lots of adds guides and background info to get you caught up on, I don’t know, the Iran nuclear talks and stuff. It’s great, and the first thing I read in the morning. Yes, even before I check Instagram. Too much awesome there. Oh, and I totally perform and love the four strength goals he suggests. Keep it simple, kids. Anyone want to come with me? Seriously, let’s do it. 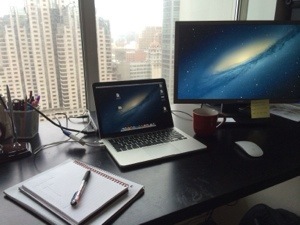 Time to make the Friday magic happen. 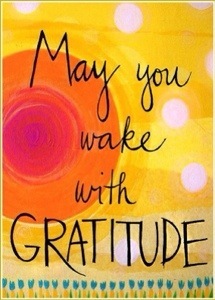 Go make it a great day, kids! Okay! So, after writing about my funk yesterday, I knew that something has to change. I thought back to when I felt really in control and good about my life, and the book “The 7 Habits of Highly Effective People” came to mind. I read it back in 2008, and it really helped me focus my energy on the things that I wanted to accomplish. When I think about the years that followed, those years included some of my biggest accomplishments. I received a big promotion at work, I completed two marathons and a half Ironman, Hulk and I chased our dreams to living in San Francisco, and we started our family. 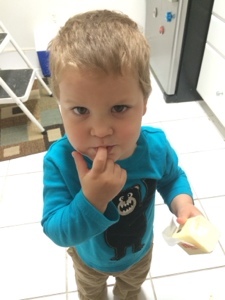 But when Squish was born, I sort of tossed my “7 Habits” habits of goal-setting and planning aside to enter the crisis mode that comes from taking care of a newborn. Over the past couple of years, I’ve slipped back into my old, reactive, wait-and-see habits instead of firing it up and going for what I want to do. I’m in a funk because I’ve lost focus on what I’m working towards in life, and it’s not a good place for me to be. After having a good talk with Hulk, he reminded me that, “when was the last time your life was perfect, and you had no problems and were completely happy all the time?” Hmm, I’ll take “Never” for $1000, Alex. I have really let myself sink into this reactive, victim-like mindset, where I am no longer in control of my life and happiness. External forces and people determine if I have a good day or a bad day. And this is really annoying, because I know I’m better than this. So, no more! I’m putting on my big-girl pants (which are growing bigger by the day, thank you Baby v2.0!) 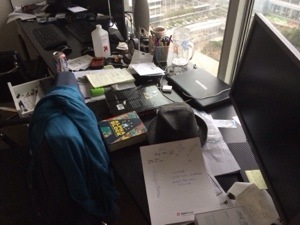 and going back to the drawing board to identify where I am and where I want to be. Big changes coming up soon, I’m sure! 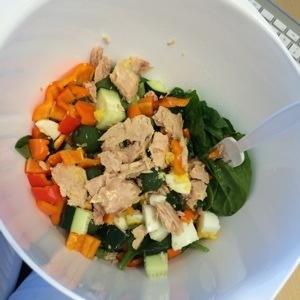 Spinach, cucumber, bell pepper, hardboiled egg, tuna, and olive oil. I do my happy dance as I eat this, it is so delicious. 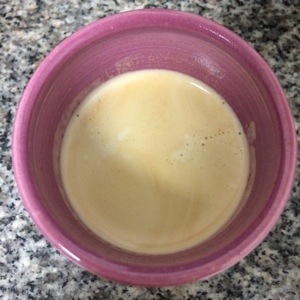 Pre-lunch coffee. 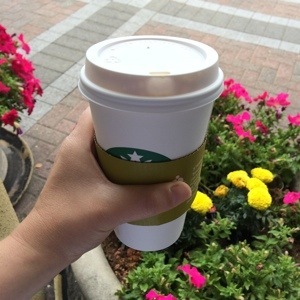 I am so glad I decided to walk to Starbucks instead of grab a coffee from the break room, the weather was beautiful yesterday! Anyway, I also made some mashed sweet taters and a salad. Phillip made an incredible balsamic vinaigrette for the salad as well. 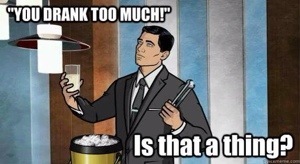 Mmm, coffee. Can’t get enough. Anyway, today’s book is actually a real book. One I bought with my own money. With pages and everything. I rarely have physical books anymore. As I may have mentioned before, I am cheap. Which is why I normally read library books. 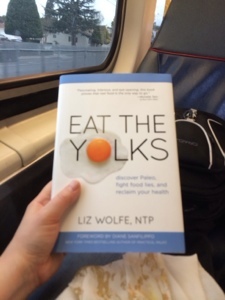 But when I heard on the Balanced Bites podcast a few months ago that Liz Wolfe’s new book Eat the Yolks was available for pre-order on Amazon, I bought it. Yes, me. Why? Because Liz is knowledgeable, down-to-earth, and hilarious and I knew if nothing else it would be a good read. And Liz did not disappoint. I actually read it twice on the plane, I found it so amusing. It would be a great book for someone wanting to know more about the paleo/primal/whole food movement and where all of today’s conventional wisdom comes from in an entertaining and non-threatening format. It’s not a “diet” book. There’s no meal plans, no yes/no food lists, none of that stuff. It’s pure education. It’s all about what you should know about the food you put on your plate. It goes into the origins and details of the big food industries: oils, grains, and meat. And how they lie to us. They lie to convince us their products are good and healthy, when in fact they’re destructive and make us sick. Liz doesn’t tell you what to eat; she tells you what you need to know so you can make your own educated choices on what to eat. My only critique is that although the content is backed by science and actual studies, it is not written in a very “science-y” tone. Which is totally fine, it’s truly written in the author’s voice, which is what makes it entertaining. It’s more of a conversational tone, with lots of pop-culture-related analogies. If you’re someone that’s looking for the hard science facts and not being told a story about the science facts, you may leave wanting more. But if you’re a pop culture junkie just looking for a good time and to learn a little something too, then this is a great book to pick up. You can learn more about Liz, her book, and her e-book The Skintervention Guide here, here and here! I hope you enjoyed today’s deviation from our usual “here’s what I ate, oh look, a cute baby!” content. At least, it was fun for me. Good Morning! Or afternoon/evening depending on from when and where you are reading this. Yesterday was kind of “one of those days”, so I would like to quietly move on and look forward to the rest of the week. Well, it wasn’t all bad. 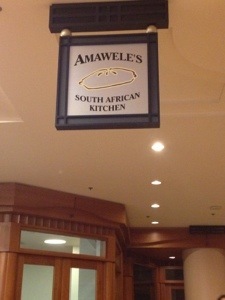 I had an awesome lunch. 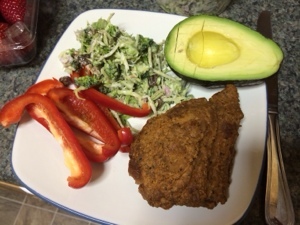 Fried chicken, broccoli slaw, an entire raw bell pepper, and 1/2 an avocado. Plus a copious amount of strawberries. So, moving on. Happy Monday! Some cheesy Facebook motivation for the week. 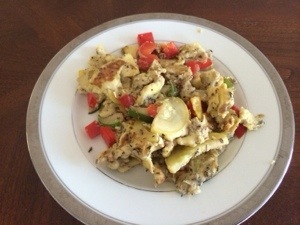 I started my day off right with a happy little scramble with bell pepper, zucchini, and Italian herbs. 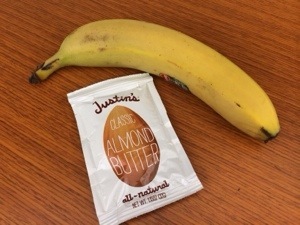 Today I want to talk about what I do for “healthy” food when I’m on the road. 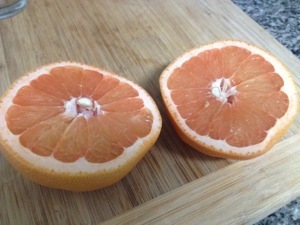 I like to use quotes when talking about “healthy” food because we are all special and unique snowflakes, and one person’s version of healthy can be completely different than another person’s version. So play around and figure out what’s best for you, and make your own “healthy”! 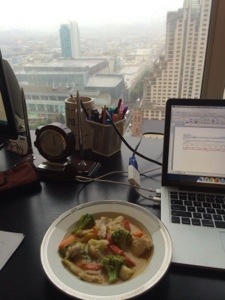 I travel a lot for work, and usually during travel and at my destination my preferred food choices are limited at best. My first couple of trips consisted of a few days of sad salad bar salads and bun-less burgers with a sad side salad, until I would give up midweek and eat pizza and sandwiches and whatever else I wanted because I was so tired of sad salads. I am human, after all. I want my food to taste good. 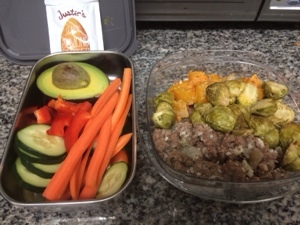 Now when I travel, I prep some food to take with me to supplement the little good stuff I can find. You’ll have to experiment with what works for your situation. I know I have a kitchenette in the hotel I usually stay at, so I’m okay with bringing stuff that requires refrigeration since I can stash it as soon as I get to the hotel. Other cut up raw veggies: bell peppers, cucumber, etc. 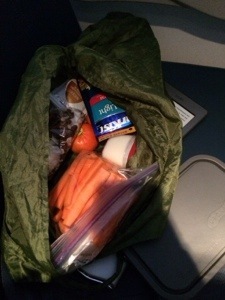 I usually stick all my food in a reusable grocery bag in my carry-on, so if anything gets leaky my bag doesn’t stink like olive brine and hard-boiled eggs. Then on the plane when it’s snack time, I whip out my bag and feast! I can also supplement those sad salad dinners when I end up at some Pasta-R-Us restaurant or a fry-it-all sports bar during the week; when I get back to my hotel room, I can pound some tuna or a couple of eggs and finally feel like I’ve had a meal. 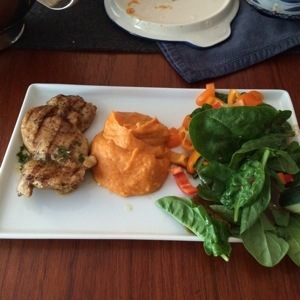 I hope that gives you some ideas the next time you’re trying to travel paleo or on a Whole30! Do you have any travel food ideas to share? Oh my gosh, you guys. I am really, really tired. And tired of salads. But mostly just tired. Darn jet lag. Because this is the only interesting content that’s happened to me in the past 48 hours, let me show you all the food. That’s mostly salad. 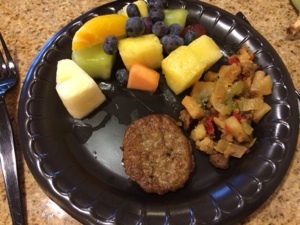 Hotel breakfast buffet of sausage patty, some sort of sausage-potato-pepper hash, and fruit. 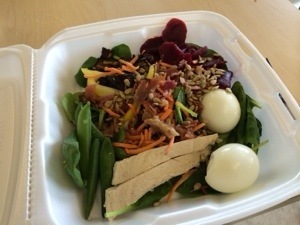 This looks like it would be a good salad, but the chicken was so dry I might as well have eaten the styrofoam container. Plus, I put the beets over the strawberries, and that was a mistake. 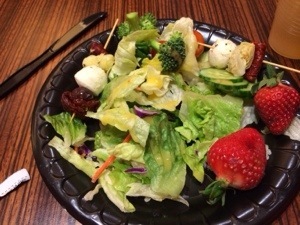 Dinner #1: lettuce salad, fruit, and the olives and artichoke off of the Mediterranean skewers. 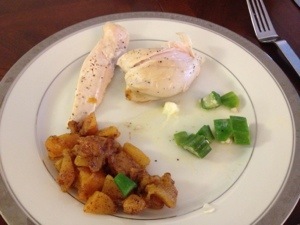 Dinner #2 (after I worked out and was ravenous). Much better! 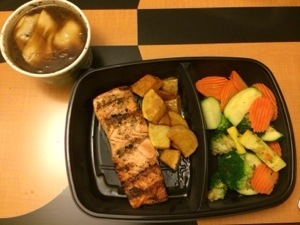 Take-out salmon, taters, and mixed veggies. French onion soup for dessert (yes, I splurged on the cheese and croutons). Breakfast buffet #2: canadian bacon and oh, more fruit. Plus 2 hb eggs I had in my room. Hmm, thought I had a picture. Oh, well. Lunch was the same as yesterday, only more eggplant and less beets. 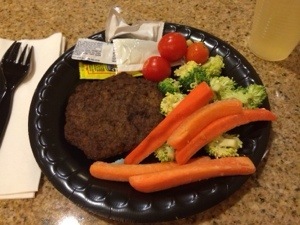 Dinner: hamburger patty and veggies. Much, much better. 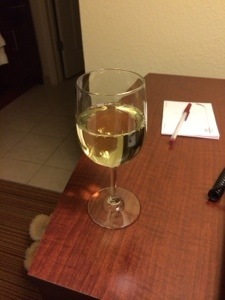 And the obligatory post-work-but-still-working glass of complimentary chablis. Not pictured: several packets of tuna, and some fruit smuggled to work from the breakfast buffet as afternoon snacks. Still making the food plan work on the road. 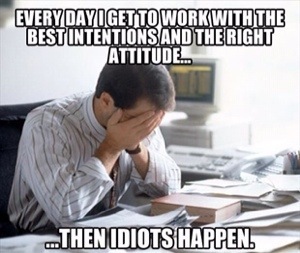 It’s frustrating at times. I was so ready to throw in the towel yesterday and dive in to all of the appetizers the hotel buffet was serving that would have totally derailed me and given me a stomach ache. The difference now is that I really want to feel healthy again, and the only way to do that is to stay away from the stuff that I know makes me crappy. Happy Friday to y’all! Who else is doing the Friday dance? 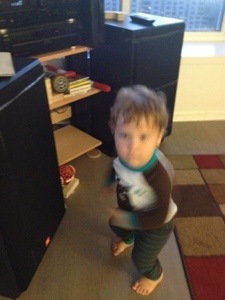 Speaking of dancing, Squish busted out some moves last night while we were playing Pandora after dinner. It’s blurry because he wouldn’t stop. Can’t stop the music. And the pumpkin “cereal” that Tina from Carrots ‘n’ Cake mentioned in her eggless breakfast ideas post the other day. 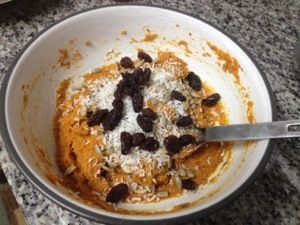 I used up the last half of the can of pumpkin with a dollop of almond butter, honey, coconut, sesame seeds, and raisins. It was okay. 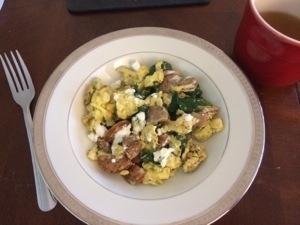 While it was nice to change up breakfast, I didn’t find it horribly delicious or life-changing. I’ll do it again if I have some pumpkin to use up. 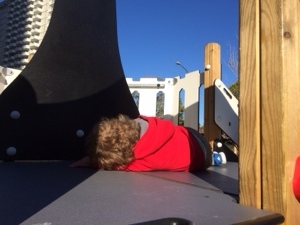 I had to tour another potential day care for Squish in the morning, which took twice as long as I thought it would. 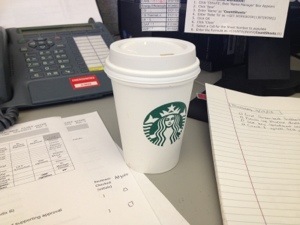 Good thing I picked up a Starbucks short latte ahead of time. Since the tour took longer than expected, I was in a crunch to grab lunch. 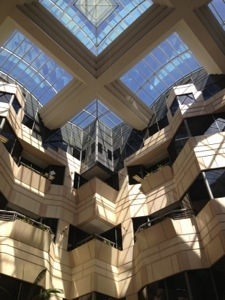 I was nearby the Rincon Center I went to with my boss the other day, so I decided to sneak some pictures while I grabbed some take out. All right, so I do not have a vast lexicon for describing architecture and style, so bear with me while I do this. 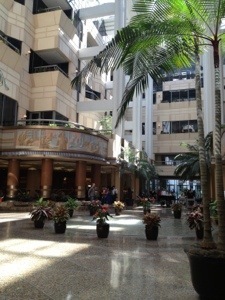 The Rincon Center was an old post office back in the day but has been converted to an office complex with a huge food court. 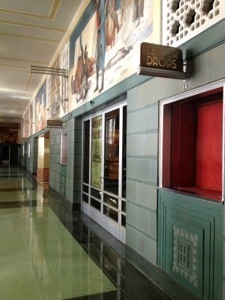 The design is really cool; they kept a lot of the original post office features. 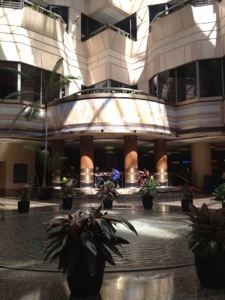 The food court has a huge ceiling with a fountain that rains down from the top, surrounded by windows. It’s soooo light and airy! I love light. To a pool on the ground. So cool. I don’t think I’ll bring Squish here; he’ll want to repeatedly run through the fountain puddle. 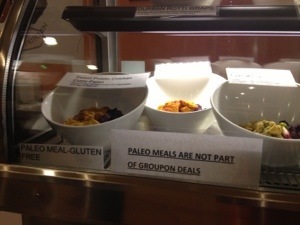 And when I passed by, I saw that they serve Paleo options! I haven’t seen that yet, how crazy. Maybe next time I’ll check it out. Anyway, here’s lunch. 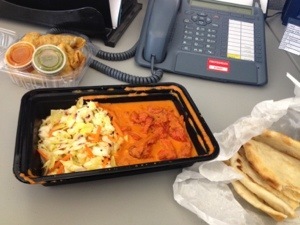 Chicken tikka masala with no rice and a salad, naan, and meat samosas. I was soooooo stuffed from lunch. Uncomfortably stuffed. Definitely a treat for the week. 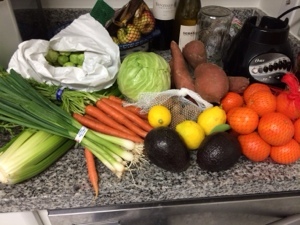 Dinner was already prepped to go. 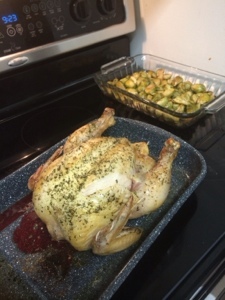 I marinated frozen chicken breasts in the Best Chicken You Will Ever Eat, Ever brining chicken recipe from Well Fed. Then I baked them with some pepper and fresh squeezed lemon. We have, like, no veggies left in the fridge so I scrounged frozen bags of butternut squash and okra. I have never had okra before, but I’ve heard it’s slimy. To be honest, I was really scared to try it (I’m a texture wimp sometimes). 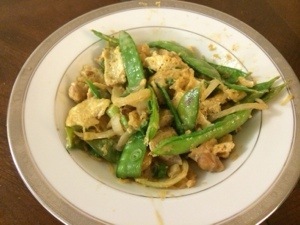 But veggies with dinner we must had, so I heated up half the bag with copious amounts of butter. Because everything is better with butter. Squish POUNDED the okra. Like, hand-over-fist plowed it down. I guess he likes okra. Mom win! I didn’t think it was too bad. Definitely the slime factor took some mental happy place to get through, but the taste and texture was all right. Especially with Squish’s encouragement I think I’ll include okra in our veggie rotation in the future. It’s Gym Day, so I’d better get my fitness on and get the morning started. 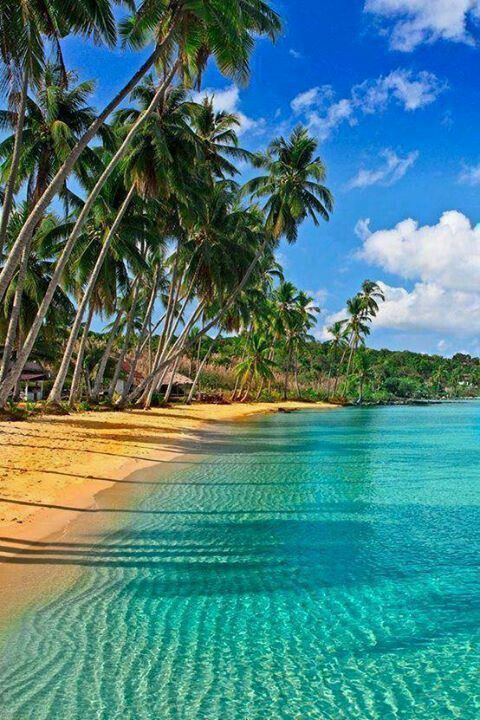 Have a most wonderful Friday, and weekend if I don’t see you later!